As the product of a stern religious upbringing by a Lutheran minister father, the great Swedish director Ingmar Bergman has had a preoccupation with life's greater questions as a thematic constant throughout his prolific and distinguished body of work. By the late '50s to early '60s, his films were consistently steeped in queries regarding the existence of God and man's place in the universe. His most profoundly realized work of the period, The Seventh Seal (1957), became a global art house favorite and staked his claim amongst the giants of world cinema. Throughout his life, Bergman had never forgotten the images of Death that he had seen rendered in the frescoes of the ancient churches he had visited as a boy. Indeed, what would become the scenario for The Seventh Seal sprung from a 1955 one-act play he had authored and produced entitled Wood Painting. Bergman had his doubts that he could ever have such a personal project financed, but he was enjoying the clout of his recent jury prize award at Cannes for Smiles of a Summer Night (1955). Bergman's producer Carl Anders Dymling agreed to back the shoot under the proviso that it would conclude in thirty-five days - a condition that Bergman, amazingly, fulfilled. The narrative opens on the shores of medieval Sweden, where the noble knight Antonius Block (Max von Sydow) and his earthy squire Jons (Gunnar Bjornstrand) are slowly making their way home after an ultimately futile decade spent away at the Crusades. The dispirited travelers have returned to find the populace of the country becoming decimated by the Black Plague. Having stopped for a respite, Block is confronted by a cloaked, sallowfaced figure (Bengt Ekerot) personifying Death. The knight swiftly barters with the reaper for a delay of the inevitable, challenging him to a game of chess with his reprieve as the prize. As they play, Block unsuccessfully tries to wheedle the truth regarding ultimate destiny from his opponent, with no success. The game becomes temporarily tabled, and Block and Jons continue on to the knight's castle keep. The story's focus then shifts to a trio of traveling entertainers who are finding declining interest in their services; the impish juggler Jof (Nils Poppe), his gently loving wife Mia (Bibi Andersson), and the undependable rake Skat (Erik Strandmark). Ultimately, circumstances bind their travels to those of the knight and squire, as they encounter ever more disquieting evidence of the physical and moral blight sweeping the land. Despite the foreboding narrative of The Seventh Seal, Bergman is still able to leaven it with comic touches, as shown in the consequences of Skat's cuckolding of a blustering blacksmith (Ake Fridell), and the moving serenity of the sequence when Block gratefully responds to the entertainers' gracious sharing of their simple fare. Throughout the journey, Death sporadically appears to Block, continuing their play until he has him in check. Block implores Jof and Mia to depart, and his final acceptance brings The Seventh Seal to its now-familiar closing image. Amazingly enough, this most famous of sequences was devised completely off the cuff in the span of ten minutes. The unit was setting up another shot when the skies shifted so dramatically as to inspire Bergman and cinematographer Gunnar Fischer to shoot the "Dance of Death" sequence. Fridell, who had injured himself the night before, was unable to go on, and a member of the crew doubled for him in silhouette. According to the biography, Ingmar Bergman by Peter Cowie, "The opening scene by the seashore and a few other hillside sequences were shot at Hovs Hallar, on the southwest coast of Sweden. Lennart Olsson had spent two weeks searching for the right spot. Hovs Hallar, with its sense of mountains coming literally down into the sea, struck Bergman as being exactly right. He also liked filming in the province of Skane because the light was so much softer than in the northern parts of the country." 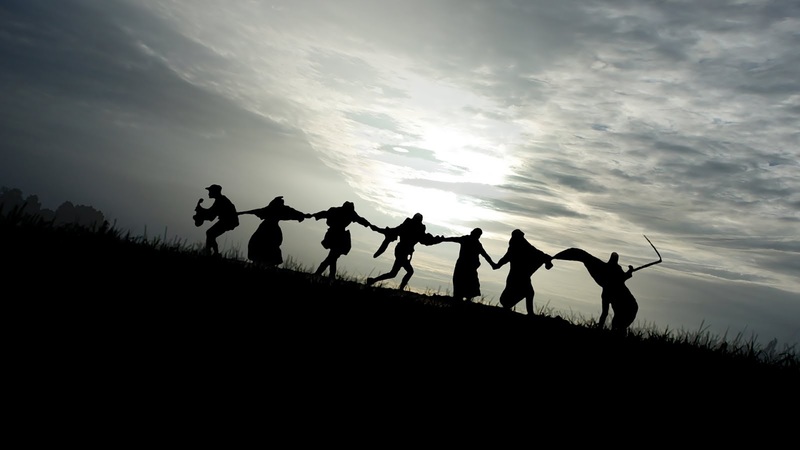 The Seventh Seal boasts multiple strong performances by the cast, many of whom would be regarded as Bergman's repertory company. Von Sydow, only 27 at the filming and projecting a gravity years beyond, became an international star due to his portrayal of the warrior struggling with his faith. The pragmatic Bjornstrand provides the perfect counterpoint. The stage comedian Poppe strikes the right notes as the near-childlike Jof, and Andersson (Bergman dedicated the script to her) is luminous in portraying the devoted spouse. Fischer, who would lens over a dozen of Bergman's efforts from the late '40s through the early '60s, proved masterful in shifting from the stark to the serene as the story demanded. By his own admission, Bergman utilized the spectre of the plague as a metaphor for the anxiety of nuclear war, and it should come as no surprise that the highbrows of the duck-and-cover generation were so quick to embrace The Seventh Seal. "Essentially intellectual, yet emotionally stimulating, too, it is as tough-and rewarding-a screen challenge as the moviegoer has had to face this year," Bosley Crowther declared in the New York Times' review of the day; this assessment has continued to hold true over the generations since. Andersson (Mia), Inga Gill (Lisa), Maud Hansson (Witch), Erik Strandmark (Jonas).